All Welch High School yearbooks have been copied to CD by Bob Martin, WHS '53. 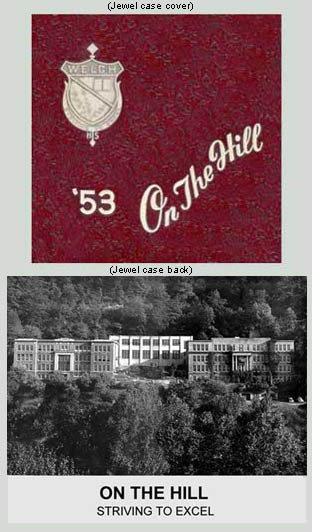 The yearbooks from 1922 - 1932 were "The Black Diamond" while 1947 - 1978 were "On The Hill". There were no yearbooks published between 1932 and 1947. Each CD contains everything in each respective yearbook from cover to cover and is presented in a jewel case similar to the one for 1953 shown below. Jewel case and CD labels will differ since presentation of each yearbook varied. The CD is formatted to allow for very sharp viewing and/or printing. Putting all our yearbooks on CD was obviously quite a time-consuming task and we are grateful to Bob for taking the time to scan and copy each and every page of each annual for us. Note that a copy of each WHS yearbook is now on the shelves of the McDowell County Library in Welch. An excellent and simple viewer program called IrfanView is included on the CDs by gracious permission of Irfan Skiljan. These CDs can also be viewed on both Mac and IBM PCs with most any graphics or imaging program, including the one furnished with Windows 95 and above.